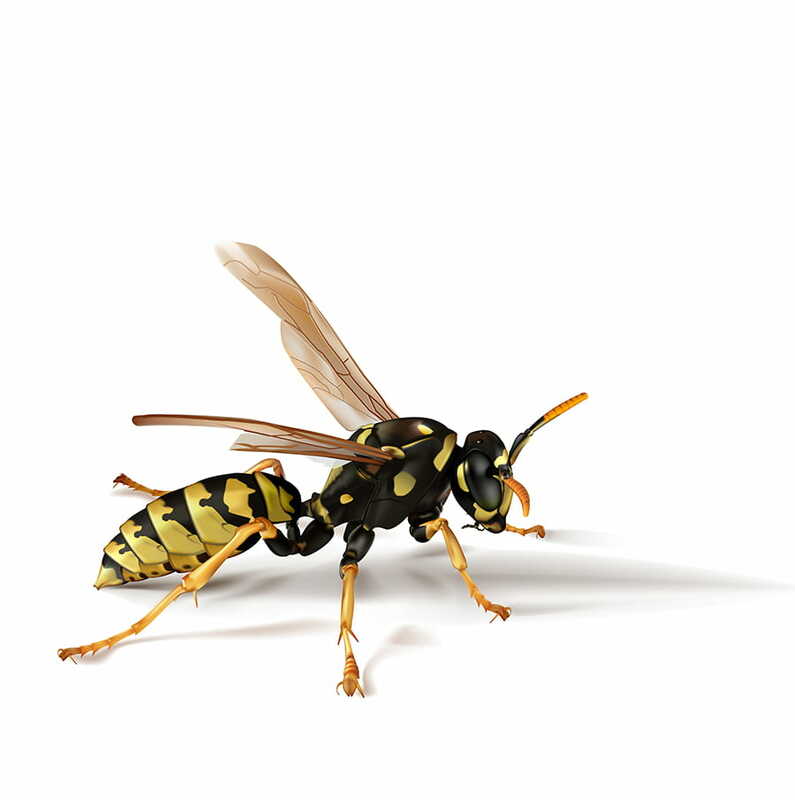 Wasps, like bees and hornets, are equipped with a stinger as a means of self-defense. A wasp’s stinger contains venom that’s transmitted to humans during a sting. While a bee can only sting once, a wasp can sting more than once during an attack. Generally, wasps are not aggressive unless their nests are threatened. However, if they do sting it is very painful and can be fatal since their sting produces a deadly anaphylactic reaction in some people who have allergies. Wasps markings range from combinations of black with yellow, white or even brown. They measure 10 mm to 19 mm with mouths made to chew. Female wasps possess a stinger and if stung, not only is it painful, but it can prove to be hazardous and sometimes fatal if allergic. Varieties of wasps common in North America are the yellow jacket, hornet and paper wasp. Their markings range from combinations of black with yellow, white or even brown. 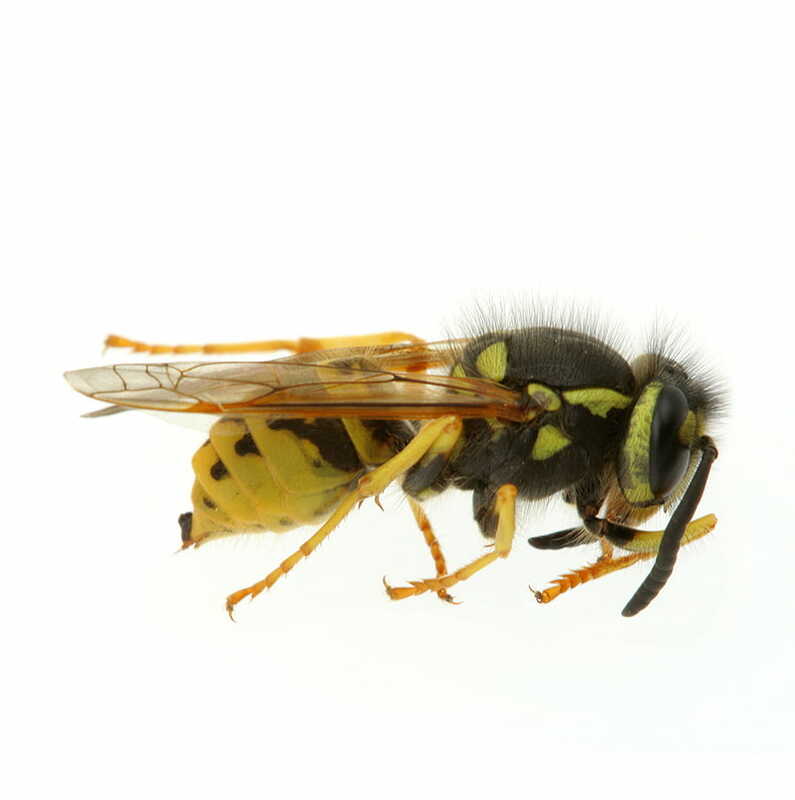 They measure 10 mm to 19 mm with mouths made to chew and female wasps possess a stinger. Wasps live in nests as colonies that consist of queens, workers and males. Nests can be found around properties on verandas, under eaves, ceilings, attics or in trees and shrubs. Some types of wasps even build nests underground or within building wall voids. A queen will lay on average 1,000 to 3,000 eggs per nest, which hatch and develop daily. Most eggs develop into sterile workers but towards the fall, the queen will lay eggs which develop into new queens and males. These will leave the nest and make their way to mating areas. The fertilized queen will overwinter under loose bark or in crevices until spring, when she will start to lay eggs to start a new colony. A queen’s average lifespan is a year while the workers and males live up to a few weeks. Yes. A wasp sting is very painful but can prove to be hazardous and sometimes fatal if allergic. Only queens and female workers possess a stinger. Normally the stinger is used to kill prey which wasps use to feed their larvae, but they will use it on animals and humans if provoked. No. Since they feed on flies and other insects they are considered beneficial. However, because they are attracted to sweet substances such as fresh fruit and juice, their presence can prove to be a nuisance. During summer and early fall when workers are foraging for food. Wasps are most active during the daytime. Nests can be found around properties on verandas, under eaves, ceilings, attics or in trees and shrubs. Some types of wasps even build nests underground. A queen will lay on average 1,000 to 3,000 eggs per nest, which hatch and develop daily. Most eggs develop into sterile workers but towards the fall, the queen will lay eggs which develop into new queens and males. These will leave the nest and make their way to mating areas. The fertilized queen will overwinter under loose bark or in crevices until spring when she will start to lay eggs to start a new colony. Yes, workers and male wasps will die off leaving only the queens to survive the winter. The new queens will overwinter under loose bark or in crevices until spring, when she will start to lay eggs to start a new colony. Yes. An abnormally cold, wet spring or hot, dry summer can affect the size of a wasp colony. Yes. Whenever possible try to eliminate fallen fruit as they attract wasps. Sealing holes and other potential nesting sites may help prevent nesting. If a nest is established, do not seal the hole until after treatment is completed and there is no more activity. 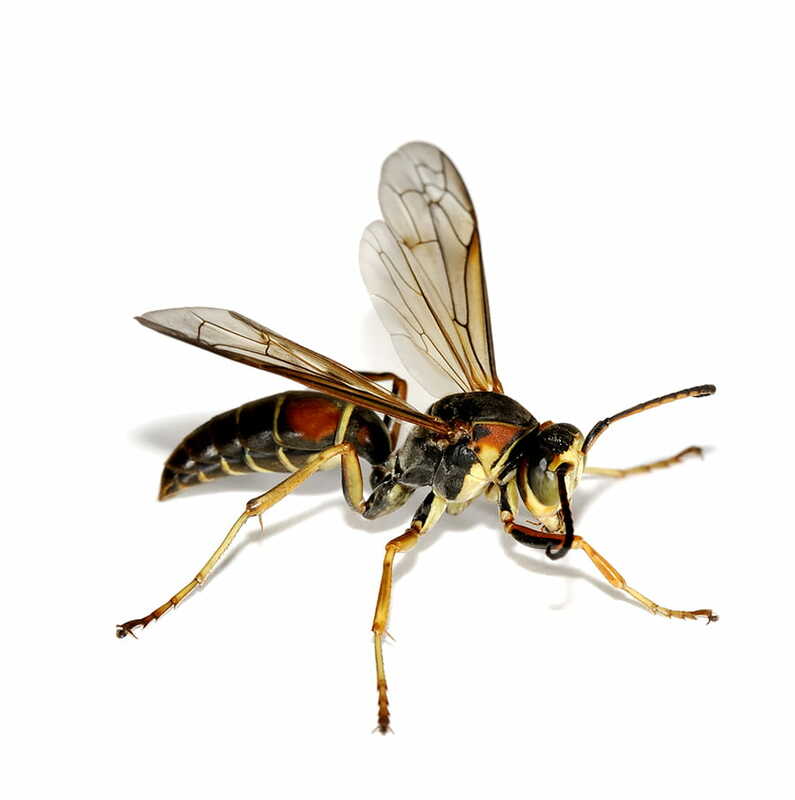 Your local Abell Pest Control office has products developed for the control of wasps. Due to the potential danger from a wasp sting, it is advisable to contact an Abell Service Representative to help treat a wasp infestation.